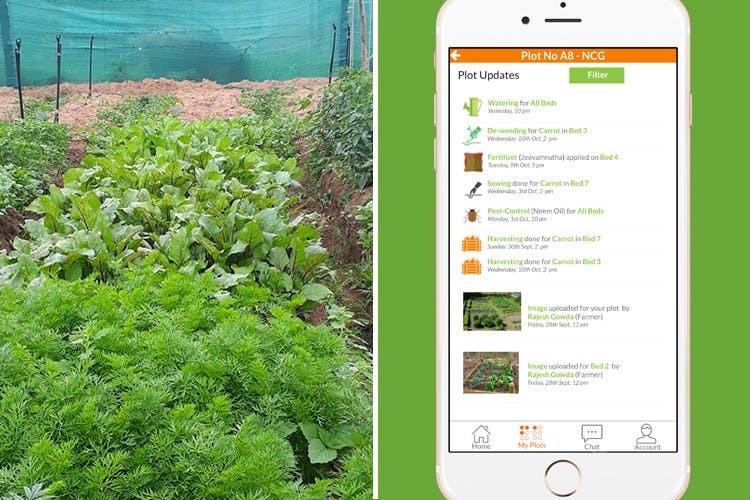 Embrace the farmer’s life with the Farmizen app that rents out small plots of earth, from farms around Bangalore, for you to grow veggies. The farm life beckons with the cool Farmizen app. It aims to create a farm ecosystem that benefits consumers, farmers and Mother Earth. For those of you who are looking to eat healthy but don’t have the room for a vegetable garden at your homes, this app is bae. For about INR 2500 a month, Farmizen will hook you up with a plot on farms in Varthur, Nelamangala, Devanahalli and Bannerghatta. Know nothing about farming? No problem! They have tailor-made starter plans from which you can choose the veggies you want to grow. The farmer will then prepare the land and grow the veggies of your choice. You can track the progress on your app and drop by to pick up the harvest. If, in the future, you want to get your hands dirty and do all the heavy lifting yourself, then, you can even interact with the farmers and they’ll be happy to share tips and tricks. Crops are grown the organic way here and they use techniques like mulching and plant pest repellent plants to ensure your veggies grow happy and healthy. Farmizen is meant to be a remote kitchen garden service. But if you absolutely can’t pick up your harvest, they’ll deliver it to you too.